All tracks performed by Hardgrave, Moreland and Helm except #6 which is Hardgrave and Helm. All rights reserved by the artists.Track #6 features Mark Hardgrave on drums and lead guitar recorded Jan1 2005. Tracks 2,3,4 & 5 recorded live in the stuidio 9-7-04. Track #1 mixed and mastered by Bret Moreland circa 2002. Casino field recording by Bret also. Photo of BrotherSync at Halloween 2004. Track #5 is for Wally Mitchel. Thanks for listening, more sooner than the last soon, and happy holidays to all. My Life In Sound steps into trio territory again as…. For more info please visit at-the-helm.us Thanks again for listening and please stay tuned for more music soon. 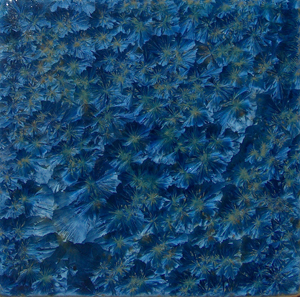 Photo by Sarajane Helm of tile by Fara Shimbo. All rights reserved by the artists. At-The-Helm Episode 12 up for your listening pleasure…. Show #12 features tracks from 1990 and 1992 that document the musical transitions that The Dozey Lumps take on to become Bindlestiff. The last 3 numbers feature a special guest in the form of either Tom Freeman on drums (Luxury Yacht) or Bill Forth on electric guitar (The Schizophonics). I think you’ll enjoy these pieces as an insight into the musical “growing” process that we were involved with at the time. My thanks again to Tom and Bill for their participation and general good nature and to Dave for all that and more. 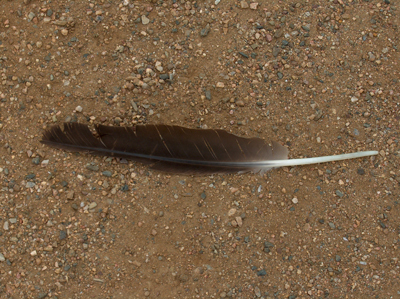 On another light note here’s a photo of a feather from a red-tail hawk I found not long ago while out walking in the Colorado countryside. Thanks again for stopping in to check out what’s new, we are nearing the halfway point in this series soon and I appreciate your continued interest in these collected works. Have a good day! Believe it or not, I’m back! Sincerest best wishes to one and all. Episode 34 of At-The-Helm is now available…. Episode 33 of At-The-Helm is now here….